Dipartimento di Scienze Statistiche, Università Cattolica del Sacro Cuore di Milano, Milan, Italy. Received June 28th, 2011; revised August 29th, 2011; accepted September 28th, 2011.
tion. We provide an application of the model and an interpretation of the main effects. order to quantify judgmental data. profiles, chosen from a sample of respondents. corporates the order of the categories of the Yk. 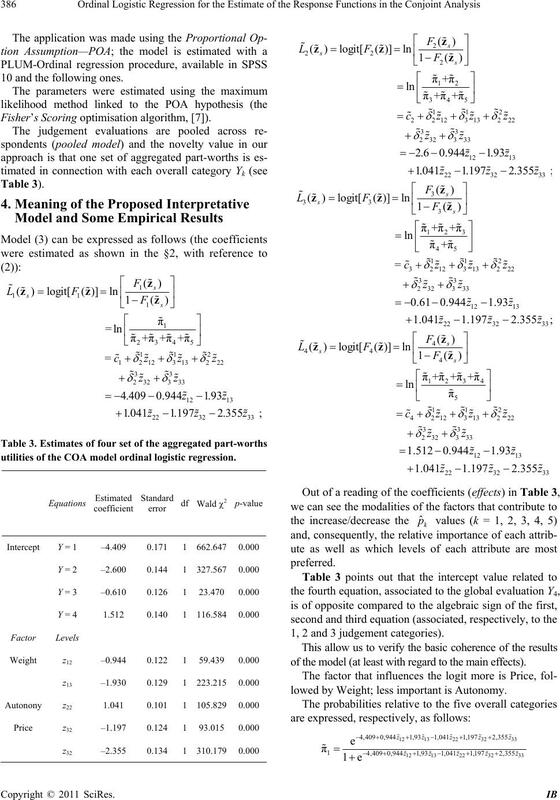 aggregate level (pooled model) . different k categories of Yk. attribute levels on the different categories of the overall. each of S hypothetical product profiles. between dependent and independent variables. “less desirable”, 5 = “most desirable”). product profile, are considered J repeated observations. application: l1 = 3; l2 = 2, l3 = 3). is necessarily equal to 1.
be drawn from the remaining q = K – 1 equations. 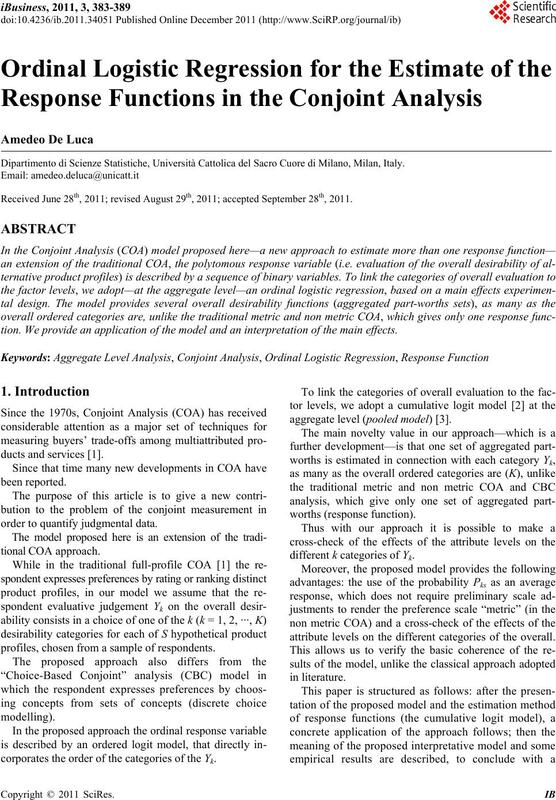  is the vector of the unknown coefficients. rather than K – 1 parameters to describe the effect of . = 79 users on S = 18 new profiles of mobile phones. (<200 €, 200 - 300 €, >300 €). 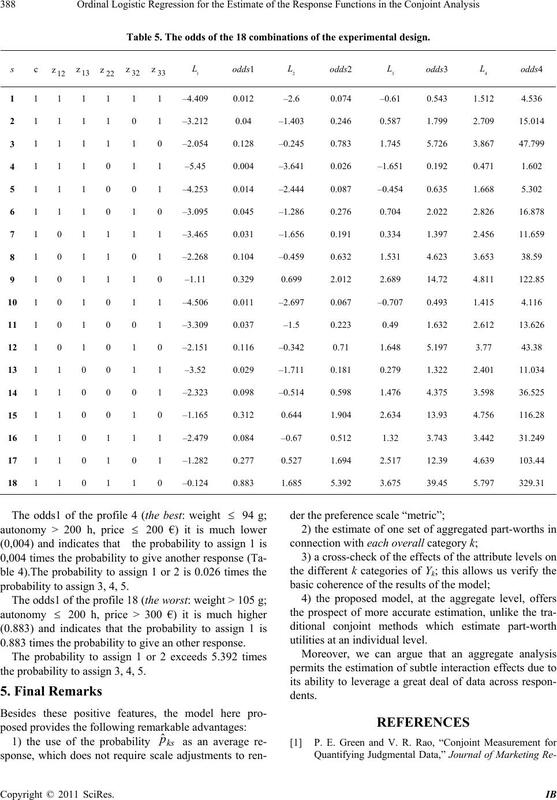 are codified as indicator variables (Z) (Table 2). 10 and the following ones. Fisher’s Scori ng optimisation algorithm, ). 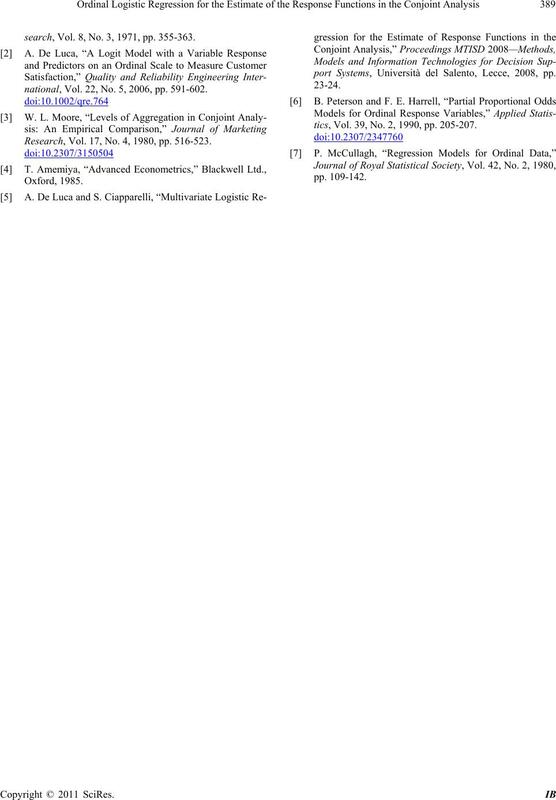 utilities of the COA model ordinal logistic regression. 1, 2 and 3 judgement categories). of the model (at least with regard to the main effects). lowed by Weight; less important is Autonomy. corresponding values of the observed proportions. 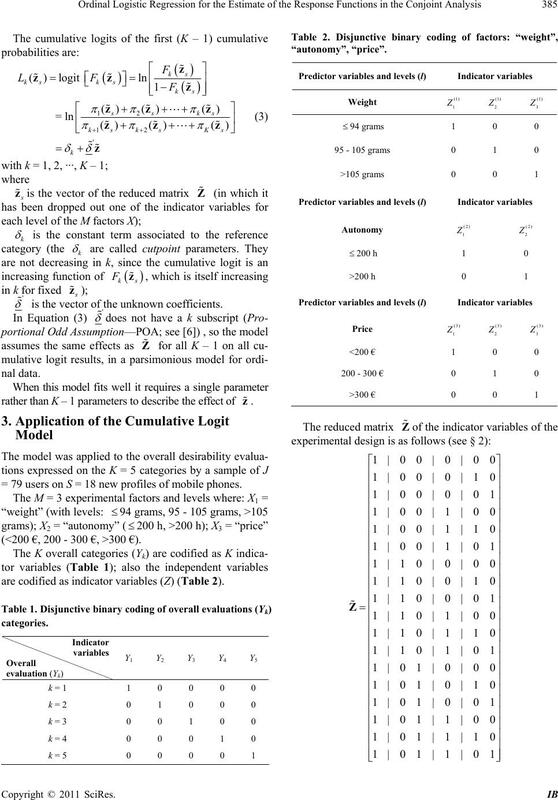 the modality combinations of the experimental design. Table 5. 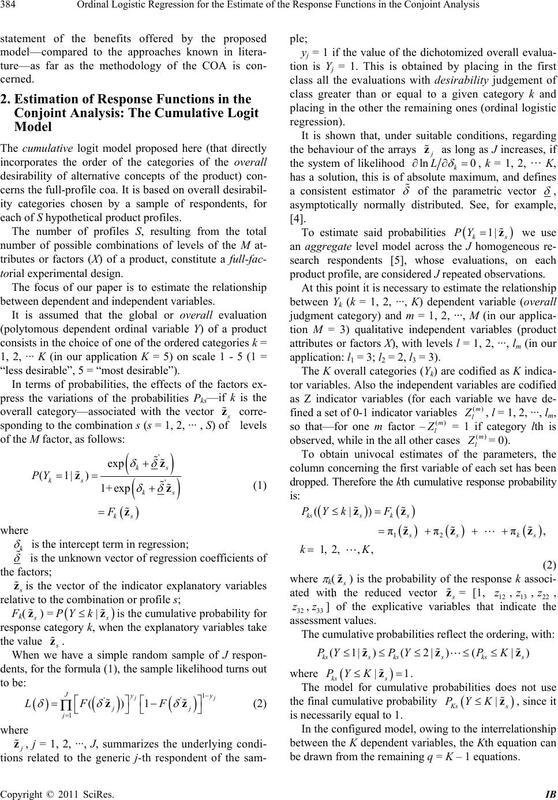 The odds of the 18 combinations of the experimental design. probability to assign 3, 4, 5. 0.883 times the probability to give an other response. 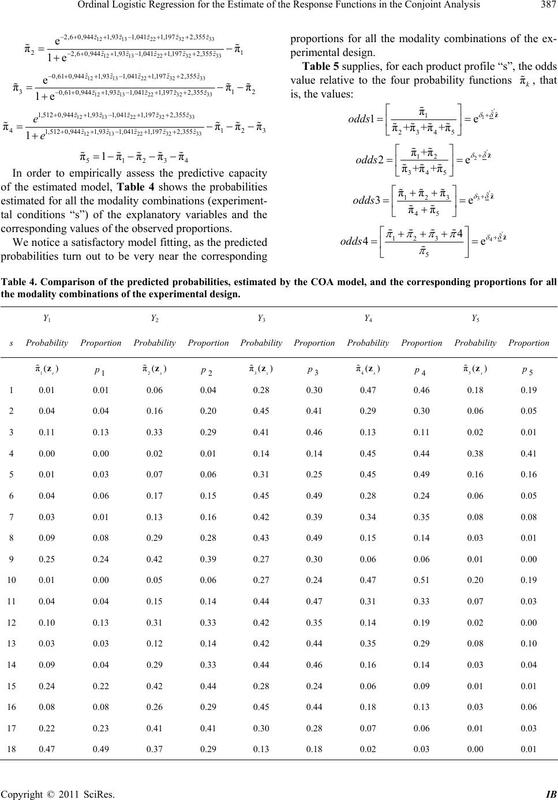 the probability to assign 3, 4, 5.
utilities at an individual level. search, Vol. 8, No. 3, 1971, pp. 355-363.
national, Vol. 22, No. 5, 2006, pp. 591-602. Research, Vol. 17, No. 4, 1980, pp. 516-523.
port Systems, Università del Salento, Lecce, 2008, pp. tics, Vol. 39, No. 2, 1990, pp. 205-207.